Ecological economics addresses one of the fundamental flaws in conventional economics--its failure to consider biophysical and social reality in its analyses and equations. Ecological Economics: Principles and Applications is an introductory-level textbook that offers a pedagogically complete examination of this dynamic new field. As a workbook accompanying the text, this volume breaks new ground in applying the principles of ecological economics in a problem- or service-based learning setting. Both the textbook and this workbook are situated within a new interdisciplinary framework that embraces the linkages among economic growth, environmental degradation, and social inequity in an effort to guide policy in a way that respects fundamental human values. 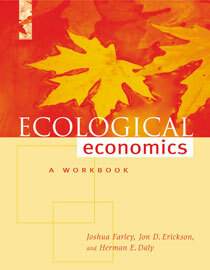 The workbook takes the approach a step further in placing ecological economic analysis within a systems perspective, in order to help students identify leverage points by which they can help to affect change. The workbook helps students to develop a practical, operational understanding of the principles and concepts explored in the text through real-world activities, and describes numerous case studies in which students have successfully completed projects. Ecological Economics: A Workbook for Problem-Based Learning represents an important new resource for undergraduate and graduate environmental studies courses focusing on economics, environmental policy, and environmental problem-solving. Introduction: What Does and Ecological Economist Do?